After not getting hold of any craft beer for around 4 weeks, Curitiba turned out to be a proverbial goldmine and it was a pity that I couldn’t stay there for longer than 2 nights – apologies to Vladimir at Diabólica and Luiz Felipe at DUM, who I hoped to meet up with for a few beers. I did, however, have a chance to check out Cervejaria Bodebrown, who won Best New Exhibitor at the 2012 Australian International Beer Awards (AIBA). The Cavalcanti family moved to Curitiba from Recife (in the north of Brazil) around 20 years ago and I met with Paulo, whose brother, Samuel runs the brewery. I quizzed Paulo on the origin of the name of the brewery, as ‘bode’ is Portuguese for goat. He told me that their grandparents used to run a goat farm a few hours from Recife and I assumed that the majority of their stock must have been brown… It actually turns out that Samuel is a huge fan of James Brown and the way he influenced music! There is also a story behind the name of the Montfort Tripel, which picked up the Silver Medal in Class 31E (Abbey Tripel – Packaged) at AIBA 2012. Paulo and Samuel’s mother is a tour guide on the famous Curitiba-Paranagua train and one day got chatting with a Belgian home-brewer who now resides in Montreal. After meeting the guys, they became very good friends and speak regularly on the phone about all things beer. The flag of Quebec now hangs in their brewery and Montfort is the name of the Belgian region where their friend is originally from. 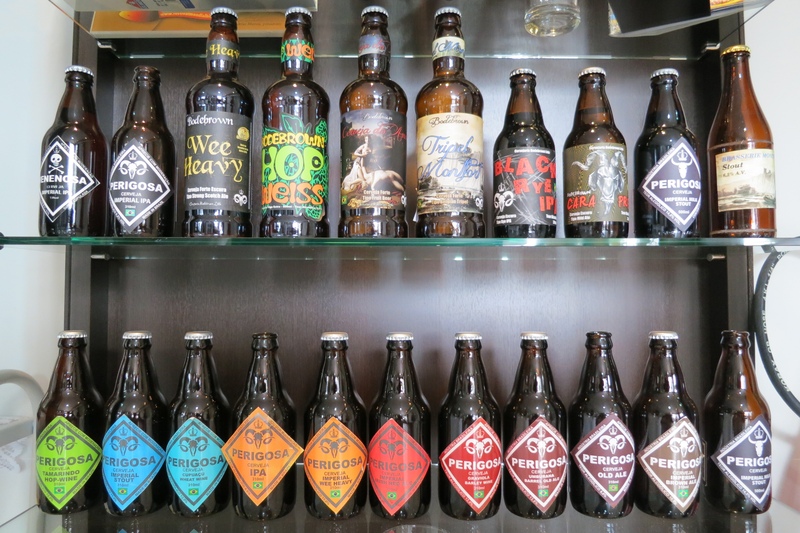 Bodebrown was the first brewery in Brazil to produce an Imperial IPA (the Perigosa, in 2010), a Scotch Ale (the Wee Heavy, also in 2010) and a Black Rye IPA (earlier this year). They are also the only ones with a Mild English Ale – the 3.5% Cara Preta, which translates as ‘Black Face’, in a tribute to the British coal miners. 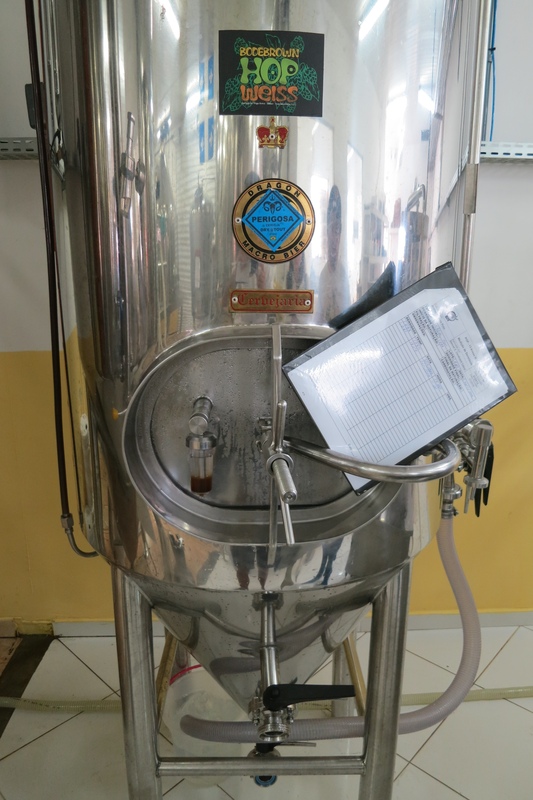 The Bodebrown site is home to the first Brazilian home-brewing school, which opened in 2006. They generally hold 1-2 courses per month and they run for 1.5 days (Friday night and Saturday), with a traditional German lunch from a nearby restaurant included. All the support a home-brewer might need is provided through an extensive library of books and all of Bodebrown’s recipes are shared online. I also noticed a steady stream of punters dropping by to purchase malt, hops and equipment from the shop. I was fortunate enough to try out their Hop Weiss, Blanche de Curitiba and Wee Heavy, which also won Silver at AIBA 2012 – this time in Class 15E (Other – Packaged).